Mitla is located 43 kilometers southeast of Oaxaca City. At one time it served as the “Vatican City” of the Zapotec Empire. It is possible to visit both Monte Alban and the ruins of Mitla on the same day. However, if you are interested in seeing the Zapotec culture at its best then we suggest you visit the Tlacolula outdoor market on Saturday. The colors in this market are truly amazing. People have lived in and around Mitla for thousands of years. In fact, archeologists who are interested in the origins of the earliest man have spent a great deal of time excavating the caves above this special ancient city. Research tells us that Mitla was probably never bigger than 1 to 2 square kilometers in size, and that it was supported by 20 square kilometers of agriculture. The best known building here is the long narrow Zapotec palace. Two large pillars flank the doorway of the palace and the rooftop was supported by six enormous columns of volcanic tuff. The private quarters found here were called uija-tao and they consisted of four amazing rooms around a central courtyard. These rich, elaborate, apartments are well preserved and intricately decorated in geometric mosaic designs that were made entirely from volcanic tuff. Only, the Mayan city of Uxmal contains this level of sophistication and elegance. The ancient Zapotec deeply valued their religious beliefs and it permeated all levels of their society. There was no separation of church and state. Only the highest level members of nobility were chosen to be priests and once chosen they underwent intensive training. 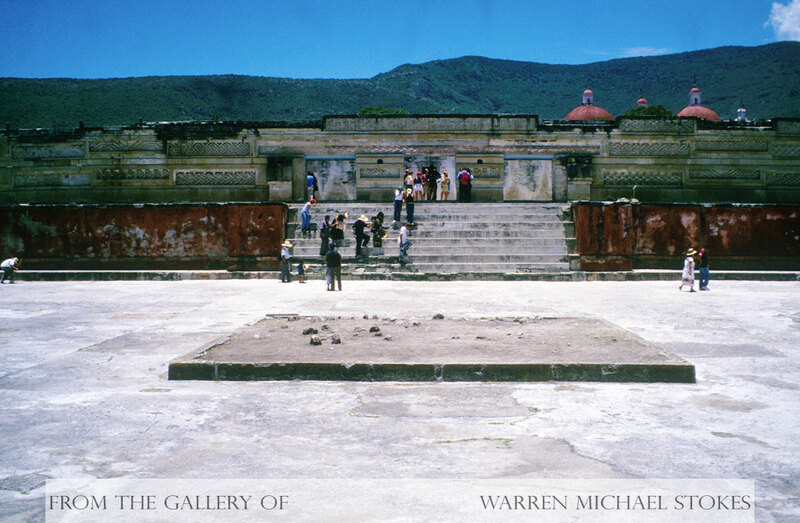 Rights performed at Mitla included the sacrifice of both animals and humans. Priests sacrificed quail, turkeys, dogs, slaves, and captives of war. There is also some evidence that children were sacrificed at this location. The high priests that resided here were known to offer their blood to the gods by way of perforating their tongues, earlobes, and other parts of their body. They did this by using stingray spines, obsidian blades, or agave spines. It seems like whatever time of the year that you go to Mitla it is hot. This it the Oaxacan desert. It you continue on the road past Mitla towards the Pacific Ocean you will quickly find yourself traveling through a cactus forest. Tlacalula offers the only chance of a good meal in this immediate area. Don't head out here without water and some snacks. If you decide to visit some of the local villages around Mitla you will quickly find out that there is very little food and purified water available. The ruins of Yagul and Dainzu are also worth a look. Dainzu has what is believed to be the oldest Tlachtili court in Mesoamerica. The ruins of Yagul lie across the road from Tlacalula and they contain some amazing tombs.